Distance: The Lemosho route is 70 kilometres (42 miles). Location: Access to the trail begins with a long drive from Moshi or Arusha to Londorossi Gate, and can take three to four hours. Londorossi Gate is located in the western base of the mountain. Height: The Lemosho route reaches the summit of Kilimanjaro at the Uhuru peak, reaching a height of 5,895 metres (19,341 feet). Trail conditions: The first part of the trail makes its way through the verdant rainforest to reach the Shira Plateau, and later travels through icefields and high alpine deserts. The Lemosho route is known as one of the most beautiful routes, offering sweeping vistas from the mountain. Travelling in a similar direction as the Shira route from the western base, climbers are likely to encounter lower traffic until the route meets with the Machame Route, and it’s one of the newer routes on the mountain, which makes Lemosho a great choice for your climb. As you travel along the western side of Kilimanjaro, you might be fortunate enough to spot antelope, buffalo, and maybe even a few elephants. 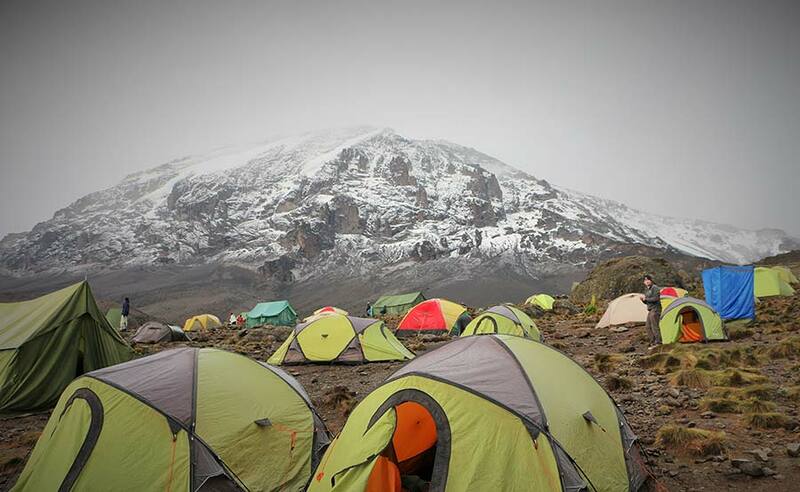 The Lemosho route can be completed in as little as 6 days on the mountain. However, it is ideally tackled over 8 days as this offers a better altitude acclimatization schedule. The first two days are spent trekking through the rainforest to Shira Ridge and leads into a relatively flat hike, moving from west to east. From this point, you’re unlikely to encounter many other hikers. Crowds will be few and far between until the route joins the Machame route near the Lava Tower. The route traverses underneath Kilimanjaro’s icefields on a path known as the Southern Circuit, before summiting from Barafu. To complete the journey, the descent is made via the Mweka route. Lemosho route has a very good success rate with high chances of reaching the summit when you take your time. With 8 days on the mountain, your chances of reaching the top are as high as 90%. It is still very probable you’ll reach the top with the 7-day hike, with a success rate of 85%. However, with the 6-day hike the success rate drops to approximately 65%. Slow and steady wins the race. During the majority of the trek, you should only be walking at a pace that you can carry on a conversation with others. Snacks will be essential to help break up the journey, and to provide a small boost of energy when you’re feeling drained. Make sure you stay hydrated, as this is essential to reduce the symptoms of altitude sickness. Where possible, aim to complete short treks before your Kilimanjaro adventure, as a fit hiker is more likely to enjoy the experience. HOW DO I PREPARE FOR THE LEMOSHO ROUTE? Any physical activity you can participate in beforehand will help make your ascent more enjoyable. As for how hard you train, this will depend on whether you’re aiming for the Uhuru Peak or embarking on a shorter journey and this will be different for everyone. WHEN SHOULD I CLIMB THE LEMOSHO ROUTE? You can climb the Lemosho route year-round, but it may be wet and cold which means you should be equipped with the right waterproof gear. Consider climbing between January–March and June–October. Note that April, May and November are the wettest months. While trekking tour operators may supply some of the gear you’ll need, there are a few non-negotiables you will need that includes waterproof gear, a headlamp, sunglasses, appropriate hiking boots, personal medication, a non-disposable water bottle and a cap or a beanie for example. HOW TO GET TO THE LEMOSHO ROUTE? Before you start your hiking escapade to the summit of Mount Kilimanjaro, you will need to establish how to get there, and the best mode of transport to suit your itinerary or tour. Travellers flying from the UK, the US, Australia or Canada and other parts of the world have a few options to explore. Each of these options should be carefully considered based on your budget and how much time you have to explore Tanzania before, or after your trek. Most importantly, don’t be tricked into booking the cheapest flight without considering if there might be a catch; including long layover times, additional visas or transport arrangements. Travellers should note these routes or airlines may be subject to change. Julius Nyerere International Airport is located just 12 kilometres from the Dar es Salaam city centre. Depending on how your tour or itinerary is planned, there are also many operators that will start their tours in Dar es Salaam and travel overland to the towns of Moshi or Arusha. If time allows, you could always stay in Dar es Salaam and enjoy the time before your hike on a few of the beaches including Kipepeo Beach, Coco Beach or Mbezi Beach. Another option that is sometimes overlooked is for travellers to fly into Nairobi Airport in Kenya and book a one-hour connecting flight to Kilimanjaro airport. If you do arrive in Kenya, there is the option for you to arrive by land into Arusha via shuttle bus or a private transfer (depending on your budget). Flights to Nairobi are likely to be cheaper than flying directly into Kilimanjaro and allow for the opportunity to explore another region before trekking to Mount Kilimanjaro. It is worth noting that while the initial flight into Kenya might seem cheaper, travellers should consider the cost of an additional visa to Kenya, local taxis, and accommodation if spending a night in Nairobi before travelling onwards and starting the tour in Arusha. WHAT ARE THE CLIMBING REQUIREMENTS FOR THE LEMOSHO ROUTE? After eating breakfast at your hotel, your guide will brief you on the day. You will drive two hours from Moshi (1400m) to Londorossi Park Gate (2100m). In the village near Londorossi Gate, you will receive a packed lunch and can buy mineral water for the hike. Then the final 45 minutes of the drive leading up to the gate will be on a bumpy forest track requiring 4WD vehicles. At the entrance gate, the guides and porters distribute the supplies and register with the Tanzania National Parks Authority (TANAPA). You are now ready to begin your 3-hour hike into the rain forest. Be on the lookout for Colobus monkeys! Along the way, you will stop for an afternoon lunch break and arrive at Mti Mkubwa (“Big Tree”) Campsite (2750m) in the early evening. The porters, who arrive at the campsite before the clients, will set up your tent and boil water for drinking and washing. The chef will prepare a snack then dinner for the clients. At nighttime, mountain temperatures may drop to freezing so be prepared! Day 9: Continue with wildlife Safari or departure . After breakfast you will you will have time to discus with our operation manage either you wild like to do wildlife safari can be arranged on time and experience this amazing destination for game view in northern Tanzania national park if not you will have time to pack your staff for transfer to airport ready to back home or continue with next destination of your choice .